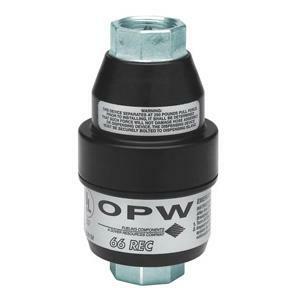 OPW 66REC 3/4" Dry Reconnectable Breakaway | CSESCO INC. The OPW 66REC is the first dry reconnectable breakaway for the conventional dispensing market. It is designed to be installed on fuel dispensing hoses and will separate when subjected to a designated pull force. The dual valves seat automatically, stopping the flow of fuel and limiting any fuel spillage, while protecting the dispensing equipment. When reconnecting the separated halves, the 66REC seals tightly on an O-ring before the poppet stems engage to open the valve. For proper operation on high-hanging hoses, the OPW 66REC 3/4" must always be installed with a “straightening” hose with a minimum length of 9", such as the OPW 66H. For low hose applications, the OPW 66REC should be installed downstream of the retractor cable.